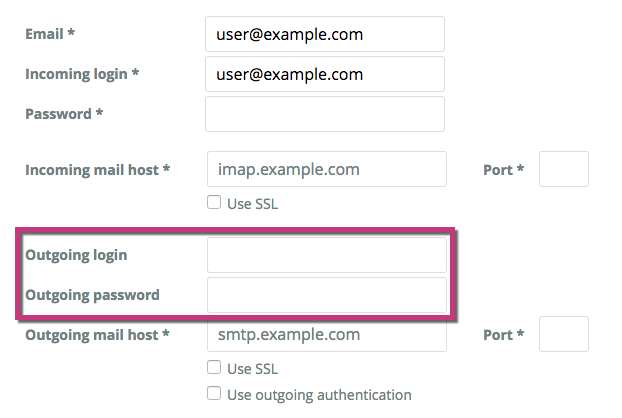 This article explains how to do the initial set up of the integrated email tool inside idibu if you are the Account Administrator. This is necessary before any other users can set up the email tool on their accounts. We have another article that outlines setting up the integrated email tool for non-admin users. If you are not the account administrator, then follow this link. The integrated email tool works in much the same way as any 'email client' you attach your email account to via IMAP and SMTP. If you're not familiar with those terms, it's simply a way of connecting your email account with another mail hosting tool like Macmail or Thunderbird on a computer, or a mail app you have downloaded and installed on a mobile phone. The key benefit is that it allows you to create and send emails to candidates (singularly or in bulk) from inside idibu, but using your own email. Any emails you send will appear in the candidate notes, but will also appear as normal in your email sent items. You can also set up the integrated email tool so that any replies are also recorded in the candidate notes. PLEASE NOTE: Integrated email is unable to connect and verify accounts when two factor authentication (2FA) is enabled. Please disable this before proceeding with the steps outlined below. 1. Go to 'Settings' then click on 'Integrated email'. 2. 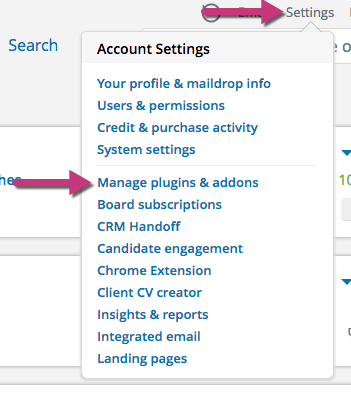 If you do not see 'Integrated email' listed in the settings drop down list go to 'Manage plugins and addons' and activate the integrated email plugin. Setting up the email tool, step by step. If you are an idibu account administrator, you will need to complete the following steps before any other user can set up and use their own email. This is because there are some global settings you need to configure which will apply to all users. NOTE: Although you will be asked for your email credentials including password, those will be applied exclusively to your user account. They won't be applied to other user accounts, but other settings you select in this process will be. 1. 'Outbound email mode only (hides webmail interface)' - Yes or No. No: The default option is 'No', which means that both outgoing mail and mail will be recorded automatically in your candidate notes (although you can still change this with another setting). It also means the idibu email interface is activated so that you can check all your mail from inside idibu if you need to. Yes: This means that only outgoing mail can be logged inside your candidate records, and that the email interface is hidden. NOTE: If you set the above option to 'Yes' some of the fields described below will be hidden. 2. The 'Send email as' field will automatically be populated with your username. This is what will appear in the 'From' area of your email when viewed by the candidate. We've therefore made this field editable so you have the option to insert a company, department or team name if preferred. 3. 'Email' - yep, you guessed it. This field requires your email address, but you should find this has been automatically populated with the email on your user profile. 4. 'Incoming login' - this may be your email or a different username depending on how your email has been set up. If in doubt, your email address is most likely the correct option and again, we automatically populate this field with your email. 5. 'Password' - this is your EMAIL PASSWORD. Please note this field is NOT requesting your idibu password. 6. 'Incoming mail host' and 'Port'. If you are unsure where to look for this information or what is required here, we explain these and the similar settings below in this article. (We'd encourage you to read that, but if you are using Outlook.com or Office 365 OR Gmail or Gmail for business, then these pages will also be invaluable). 7. 'Use SSL': This will depend on whether your incoming mail server supports SSL. If you are unsure, again the article mentioned in point 5. will assist you here. 8. 'Outgoing login' and 'Outgoing password'. These will be the same details you provided in steps 3 and 4. 9. 'Outgoing mail host' and 'Port'. The outgoing mail host will look similar to the format of the incoming host, but please note it is not the same. Be careful to input the correct details here for both the 'Outgoing mail host' and the three digit 'Port' number. 10. 'Use SSL' and 'Use outgoing authentication'. Again, this will depend on the settings required by your email provider in the case of SSL, or those selected within your actual email settings. Again, we provide some further information here if you are unsure. 11. SYSTEM WIDE SETTINGS > ''Make email links use webmail as default client'. Setting this to 'Yes' means that the integrated email interface will appear whenever an email link is clicked on inside a candidate record. If you set this to no, then clicking the candidate's email address should prompt your normal email host to open - although please note this may depend on other variables with your IT set up and is not fully within our control as a result. 12. 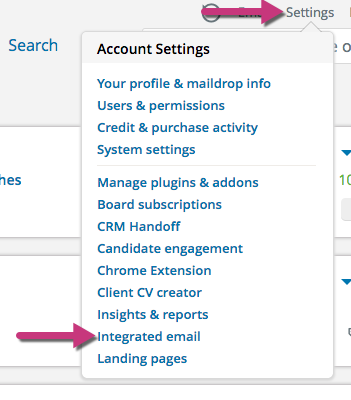 SYSTEM WIDE SETTINGS > "Allow automatic import of emails into candidates". If in step 1 you chose to activate the email interface so all your emails can be managed through our email client tool, BUT you don't want all incoming mail to be recorded against candidate records, then select 'No' from the drop down list. Otherwise, select 'Yes'. 13. When you have completed all the settings, click 'Save'. Important: If you are using email by Google, you may also need to update your account's security settings. We understand that it can be tempting for users to add themselves as a test candidate sometimes. This might be in the early days of them using the system, or to test the application workflow on an advert they have posted. This is completely fine, but if they use their work email on that candidate record then there is a high risk that conversations between them and another user in your company will be exposed in the idibu timeline, or found by colleagues recorded on the test candidate's record notes. If the user concerned is a member of the management team, then the implications for these mail conversations being recorded becomes even more serious. While on the one hand, this could be regarded as a user education issue (i.e. don't add your company email to a candidate record), on the other, we wanted to give you an option to safeguard against this scenario. 2. This field allows you to input your company email domain, so that if any company email address should be added to a candidate record, no company emails will be recorded as notes against that particular record. 3. If you use several email domains in your company, then you can add multiple domains separated by commas into this field. 4. When you have added your domain(s), then click the green 'save' button as described above.